Rapid eye movement sleep, or REM, is one of the five stages of sleep that most people experience nightly. It is characterized by quick, random movements of the eyes and paralysis of the muscles. We have conducted a survey based on questions related to sleeping habits and pattern of their dream. Purpose of this survey is to prove a hypothesis that says ‘rapid eye movement or sleep twitches can enhance your brain activity’. We have selected normal or healthy subjects related to different ages, gender and professions. Questionnaires were filled by these subjects and we found that mostly people experience sleep twitches and they wake up with active state of mind. We also asked their level of alertness during day time and we found that subjects are alert mostly. Rapid eye movement, Paralysis, Questionnaire. 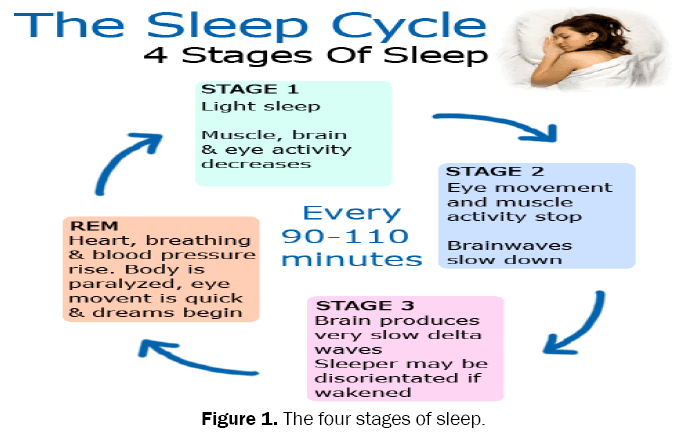 Rapid eye movement (REM) sleep is a stage of sleep characterized by the rapid and random movement of the eyes . REM sleep typically occupies 20-25% of total sleep, about 90-120 minutes of a night's sleep. The first REM sleep period occurs 90-120 min after sleep onset with the last REM period usually being the longest and normally occurs close to morning . The relative amount of REM sleep varies considerably with age. A newborn baby spends more than 80% of total sleep time in REM . Physiologically, certain neurons in the brain stem, known as REM sleep-on cells, (located in the pontine tegmentum), are particularly active during REM sleep, and are probably responsible for its occurrence. The release of certain neurotransmitters, the monoamines (nor epinephrine, serotonin and histamine), is completely shut down during REM [4-6]. This causes REM atonia  an almost complete paralysis of the body, due to motor neuron inhibition. Researchers say the findings show twitches during rapid eye movement (REM) sleep comprise a different class of movement and provide further evidence that sleep twitches activate circuits throughout the developing brain. In this way, twitches teach newborns about their limbs and what they can do with them . Blumberg and fellow graduate student studied that there was a lot of brain activity during sleep movements but not when these animals were awake and moving . In 1950, it was discovered for the first time that corollary discharge is a split-second message sent to the brain that allows animals, humans and more to recognize and filter out sensations generated from their own actions. This filtering of sensations involves in differentiation of sensations between sensations arising from animals own movements and those from stimuli in the outside world. It was further noticed by researchers that brain activity was increased while the newborn rats were twitching during REM sleep but not when the animals were awake and moving. The experiments were consistent in supporting the idea that sensations arising from twitches are not filtered: And without the filtering provided by corollary discharge, the sensations generated by twitching limbs are free to activate the brain and teach the newborn brain about the structure and function of the limbs. Moreover Blumberg emphasized that if twitches were like wake movements, the signals arising from twitching limbs would be filtered out. But as they are not filtered out, its again suggests that twitches are special because they are needed to activate developing brain circuits . According to one theory, certain memories are consolidated during REM sleep. Artificial enhancement of the non-REM sleep improves the next-day recall of memorized pairs of words . Tucker demonstrated that a daytime nap containing solely non-REM sleep enhances declarative memory but not procedural memory . Monoamine oxidase (MAO) inhibitors and tricyclic antidepressants can suppress REM sleep and these drugs show no evidence of impairing memory. According to another theory, known as the Ontogenetic Hypothesis of REM sleep , Alexandre Tiriac, Mark Blumberg says this difference between sleep and wake movements may be critical for how twitches, which are most frequent in early infancy, contribute to brain development. Studies investigating the effects of active sleep deprivation have shown that deprivation early in life can result in behavioral problems, permanent sleep disruption, decreased brain mass, and result in an abnormal amount of neuronal cell death . A sample of 50 individuals was taken of different ages, gender and occupation. The individuals were selected randomly. • 14 questions were asked from individuals related to their sleeping, nocturnal behavior, their activities and level of alertness. • Questions about any disease or medications were also asked. A questionnaire was prepared in which questions related to sleeping habits, activities during unconsciousness, dreams, activities after wakening up and level of alertness included. This survey is done on randomly selected individuals. Around 5 minutes were utilized in this survey. After completion of the survey experimenter thank the subject for their active participation. This study is based upon a hypothesis that sleep twitches or rapid eye movement (REM) enlightens brain activity. REM is basically is a stage of sleep characterized by the rapid and random movement of the eyes and some body parts. Physiologically, certain neurons in the brain stem, known as REM sleep-on cells, (located in the pontine tegmentum) are particularly active during REM sleep, and are probably responsible for its occurrence. The purpose of this study was to evaluate public awareness about REM and to evaluate its influence on brain activity. This study is basically questionnaire based. We have collected sample of 50 individuals of different ages, occupations and gender. And variety of observations has been collected. Out of 50 individuals, 39 were known what REM is. While 39 individuals experience REM themselves. 12 peoples observe REM in their babies and found different behaviors in their babies. 5 peoples find their babies lazy, 7 find active and 4 find their babies irritated. 20 individual’s dreams match their nocturnal behavior. Only 1 fined it sometimes. 25 individuals observe that their arms or legs move while sleeping. 15 persons hurt their bed partners because of their movement. 5 peoples observes snoring, 14 observes sudden limb movement, 4 observes laughing and 1 observes crying while sleeping, 1 observes fighting, 12 individuals observes shouting and speaking while sleeping. 26 individuals observe that their movement while sleeping awakes them up. 22 individuals remember their dream contents. 19 persons have disturbed sleep usually. It has been observed that individuals of this sample size also suffering with different disease states i.e. 5 persons has depression, 2 persons has hypertension and diabetes mellitus. 1 person is patient of hepatitis B, epilepsy and nervousness. 6 individuals of the total were on different medications like insulin, norvasc, lamivudine, interferon, tegral, depricap, merol, advant. advant, amaryl, veldoz, glucophage, iron supplement, pregabalin, lamotigrine and benzodiazepines. Age is correlated with sleep twitches or REM in the babies (Coefficient 0.55, P value 0), this relationship showed that parents are keen observer about the REM movements in their children’s. Awareness about the REM is fairly correlated with experiencing sleep twitches, matching dream contents with nocturnal behavior and the disturbance in smooth sleeping with respective coefficients and P values; (0.39, 0.38, & 0.31: 0.005, 0.006 & 0.031). The activeness of the brain has very strong correlation with nocturnal behavior of the individuals surveyed (Coefficient 1.00, P value 0.000), it further has strong correlation with arms, legs movements during the sleep (Coefficient 0.62, P value 0.000). The fair correlation has been observed within remembrance of dreams contents, disturbance of sleep frequencies and brain activeness (coefficients 0.50, 0.46 and P values 0.000, 0.001 respectively) (Table 1). The value of the adjusted R square is 0.485 which means that 48.5% of the variations in the activeness of the brain are explained by REM activity in the kids, whereas 51.5% of the variations in the activeness of the brain are due to stochastic factors which are unknown. There is a positive relationship between the dependent variable and the independent variable. Every unit change in the REM activity in kids will bring 1.72 units changes in the activeness of the brain on the average. The t value of its slope coefficient is greater than two which prove that there is significant relationship between the REM and activeness of the brain. The value of the F is 35.84 and the probability of such an F is almost zero so we are compelled to reject the null hypothesis and we can conclude that there is significant REM impact on the activeness of the brain in the kids. The value of the adjusted R square is 0.122 which means that 12.2% of the variations in the activeness of the brain of an adult are explained by REM activity, whereas 87.8% of the variations in the activeness of the brain are due to stochastic factors which are unknown. There is a positive relationship between the dependent variable and the independent variable. Every unit change in the REM activity in adults will bring 0.203 units changes in the activeness of the brain on the average. The t value of its slope coefficient is greater than two which prove that there is significant relationship between the REM and activeness of the brain. The value of the F is 7.82 and the probability of such an F is almost zero so we are compelled to reject the null hypothesis and we can conclude that there is significant REM impact on the activeness of the brain in the adults. Level of alertness of subjects out of 10 is as follows (Tables 2 and 3). Table 2: Level of alertness of subjects out of 10 is as follows. Table 3: Neuronal system activity during REM sleep. The four stages of sleep (Figure 1). Figure 1: The four stages of sleep. REM activity in babies based upon the observation of their parents (Table 5). This study provides first time the prevalence of sleep twitches or rapid eye movements in adults and kids in Pakistan. It concluded that mostly peoples experience sleep twitches or rapid eye movements, find themselves active that reveal the lack of rapid eye movements lead towards depression. This evaluation describe that level of alertness found more in kids as compare to the adults. The results showed strong relation between the REM and alertness in the kids due to the reason that we obtained the data pertain to REM activity from their parents. Here we would like to express that it very difficult for an individual to identify his or her REM activity this is the limitation of this research so we suggest that cross sectional data be obtained for analysis for example data gathered from husband to wife and vice versa. 1.Kryger M, et al. Principles & Practices of Sleep Medicine. WB Saunders Company. 2000;1:572. Lyness and, D’Arcy. Nightmares, Kids Health.The Nemours Foundation. Van CauterE, et al. Age-related changes in slow wave sleep and REM sleep and relationship with growth hormone and cortisol levels in healthy men. JAMA.2000; 284:8618. Aston-Jones G et al.Role of the locus coeruleus-norepinephrine system in arousal and circadian regulation of the sleep-wake cycle. Chapter 6 in Brain Norepinephrine: Neurobiology and Therapeutics. 2006;10:1327-1336. Siegel JM. REM Sleep. Chapter 10 in Principles and Practice of Sleep Medicine. (4thedn),.Elsevier. 2005;120-135. Lapierre O and Montplaisir J. Polysomnographic features of REM sleep behavior disorder: development of a scoring method. Neurology. 1992:42:1371–1374. Marshall L, et al. Boosting slow oscillations during sleep potentiates memory. Nature.444:6103. Mirmiran M, et al. Effects of experimental suppression of active (REM) sleep during early development upon adult brain and behavior in the rat. Brain Res. 1983;283:277–86.